Gothic hairstyles, can curly hair look good with your gothic outfit? Anyway, one of my gothic readers was asking me tips for curly hair and I have been thinking and reached the conclusion that I must write a post about it. Does curly hair go with the Goth look? I straighten mine OR I go for the wavy 40s look. But what about the 100%curly hair? 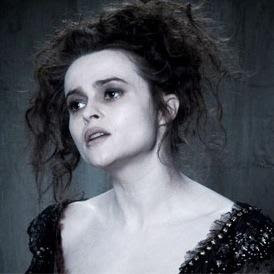 When you think of Goth and then curly hair....what does it come straight to your mine?....Well, Helena Bonham Carter, wh0 is not a good reference because she is a clear example of how not to dress and on top of that, curly hair (which is already difficult to style, in my opinion) emphasizes even more her "tramp-y" look and it reinforces my theory that curly hair is not a very "gothic" look. It doesn't go with the sophistication and groomness that Goth requires and! very important, is a very warm and "virginal" look (if you think about it, Angels are always associated with blonde little curls) that is completely the opposite of the straight, sharp lines of black raven hair-do. There are very differents ways to wear curly hair. You can give a romantic/mystic air to it by keeping it long and simple. This way, because of the weight, the curls will be very easy to manage and style and they tend to get bigger. However, prepare yourself to spend long time washing it, drying it and looking after it. It will be so long that the whole experience it might even take you to mystical levels! This length doesn't tend to get as frizzy as shorter lenghts, however it dries much much easier so you will need to use conditioner in EVERY single washing and I would suggest you to get a very good leave-in serum to apply after every wash. (I like the one by Swartzkopf -a small pink tube, it is very creamy but not greasy). The spray formats don't work, so please, don't even consider buying one. I have tried them all and they are shite, it is like leaving your hair without nothing on it. Option B is to wear layers. If they are done properly, they will really revive any hair. You see, the problem of wearing one lenght hair (short or long) is that the curls tend to die on the roots (because they can't support the weight) so you look somehow stupid. The secret is to have very big layers (or you will end up looking like a mushroom with hair all over the place) always starting from just under the jar (this way, it's easier to keep under control because you can tie it all in a pony tail or keep it behind your ears with a nice pin). After al l these tips you must be thinking "okay, nice haircuts but I want to look more groomed and sophisticated, what else do I-ve got?" 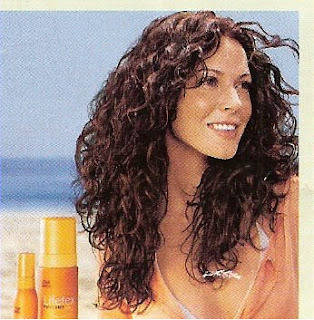 Well, option A -the obvious one- is to re-shape your curls professionally, with rollers. That means curlying your hair again. (or you think all those fantastic curls you see on telly are natural? NOOOO! Even Andy Mcdowell has hers done professionally for those adverts. Those curls are too perfect, they don't exist). Obviously, what lots of people do, taking advantage that they can choose a new hairdo, they go for softer and bigger curls, resulting in a retro 1940s look or just very big waves. However, if you still want to keep your small curls, I would suggest a very nice up-do which, in my opinion, are much more impressive with curly hair. I Like the one that Eva Green has. She looks elegant, groomed and gorgeous!